Miami University is a safe residential campus located in Oxford, Ohio—an idyllic university town. Oxford (35 miles north of Cincinnati) features a low cost of living and a stimulating mix of restaurants, shops, parks, and entertainment venues popular with University students. Type of SCHOOL: Miami University is a midsize, nationally accredited institution that offers an extraordinary undergraduate experience. Immersing students in both academic and cocurricular experiences has enabled Miami University to achieve a top-tier national ranking among universities that provide the best student outcomes. Size of campus: The main campus encompasses 2,138 acres with 188 buildings. International student services: Miami University offers an array of resources for international students, including International Student and Scholar Services, the American Culture and English Program, and International Student Orientation as well as several clubs with an international focus. Financial aid: International Student Scholarship awards can vary from $2,000–$16,000 per year and are determined by academic records, test scores, and other factors received by Miami University at the time of application. Additionally, international students with equivalent US grade point averages of 3.50 or higher and ACT scores of 27 or SAT scores (Evidence-Based Reading and Writing + Math) of 1280 or higher are also considered for merit-based scholarships. Test score requirements: To be considered for direct admission into an undergraduate degree program at Miami University, international students whose native language is not English should have earned the following minimum scores: TOEFL—internet based: 80, paper based: 550; IELTS—overall band: 6.5; PTE Academic—overall score: 53. Discover the meaning of a Public Ivy. Miami University, in Oxford, Ohio, founded in 1809, has a national reputation for a superior educational experience and unparalleled professional preparation of its students. PayScale.com ranks Miami University among the top public universities in the nation for best salary potential after graduation. 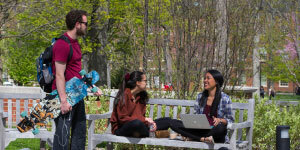 Miami University is consistently cited for the quality of its academics, isrecognized by U.S. News & World Report as the top public university in the country for best undergraduate teaching, and has consistently ranked in the top five for both private and public schools for the past eight years. Supported by experiences that lead to student success, Miami University students receive personal attention and guidance from our most experienced professors. Fiske Guide to Colleges 2017 recognized Miami University for its dedicated faculty and “strong emphasis on liberal arts and its opportunities for research” in its “Best and Most Interesting Colleges and Universities” list. All undergraduate students benefit from a well-rounded liberal arts foundation, developing lifelong skills for any career. More than 45% of students study abroad; nearly 100% participate in internships or field work prior to graduation. Additionally, more than2,000 undergraduate students participate annually in significant research and scholarship activities. The quality of its graduates andits academic reputation give Miami University a solid base of employers significantly larger than most universities its size. Miami University’s four-year graduation rate is among the top in the nation for public universities, and students are accepted into medical and law schools at rates far above the national averages. Additionally, Miami University’s reputation attracts employers to campus for four times as many interviews as are held at other universities of its type. As a result, Miami University isregularly cited by national publications as a “best value” in higher education. This recognition as having ahigh return on tuition investment is supported by research, surveys, and national data that indicate 97.3% of Miami University students who graduated between August 2016 and May 2017 were employed or continuing their education by fall 2017 (based on research, surveys, and national data of 81.2% of the 2016–2017 graduates). Miami University offers vibrantresidential and community-based programs that build leadership and develop citizenship, character, and lifelong friendships. With more than600 student organizations, strong living-learning communities, sporting events, and student performances, Miami University is a place for students to live without pause and gainan education that pays dividends for a lifetime.